Qatar’s non-oil exports registered strong growth during July 2018 with a value of QR 2.66 billion compared to QR 1.655 billion during the previous month (June 2018), (60.7 percent), and increased by (100.3 percent) during the same month (July) from the previous year at QR 1.328 billion . 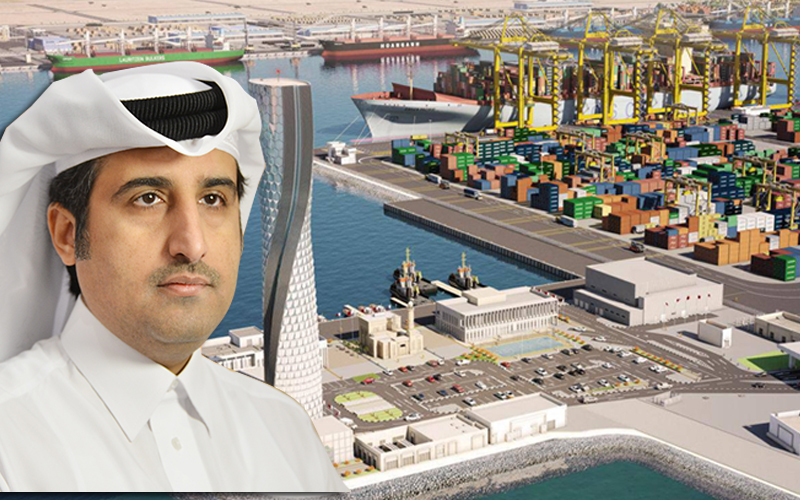 The monthly report of the Qatar Chamber on Foreign Trade for the Private Sector, prepared by the Department of Research, Studies and Management of the Chamber’s members from the certificates of origin, issued 3843 certificates of origin during last July, including 3513 general model certificates and 143 unified certificates for the GCC countries, (industrial), 159 unified Arab certificates of origin, 27 certificates of origin for preferences, and one uniform certificate for Singapore. Saleh bin Hamad Al Sharqi, Director General of Qatar Chamber, said that the record increase in non-oil exports last July by 100 percent compared to the same period last year is a real indicator of the development of non-oil production sectors in the country, which is witnessing rapid growth thanks to the facilities offered by the government departments to the industrial sector, which dominates the movement of non-oil exports, in addition to the increasing demand for the Qatari product, which is of quality and meet all international specifications, strengthening its confidence in the global markets. Al-Sharqi praised the industrial sector, which remains the main source of non-oil exports. He praised the role of companies operating in the fields of aluminum, iron and steel, chemical fertilizers, chemicals, industrial gases and other petrochemical industries, especially after the great attention and support that the food industry in the country has received since the last period. Al Sharqi stressed that the Chamber will always the State supporting and encouraging the industrial sector in all possible ways in order to achieve the desired economic diversification, which is a cornerstone of the Qatar National Vision 2030. 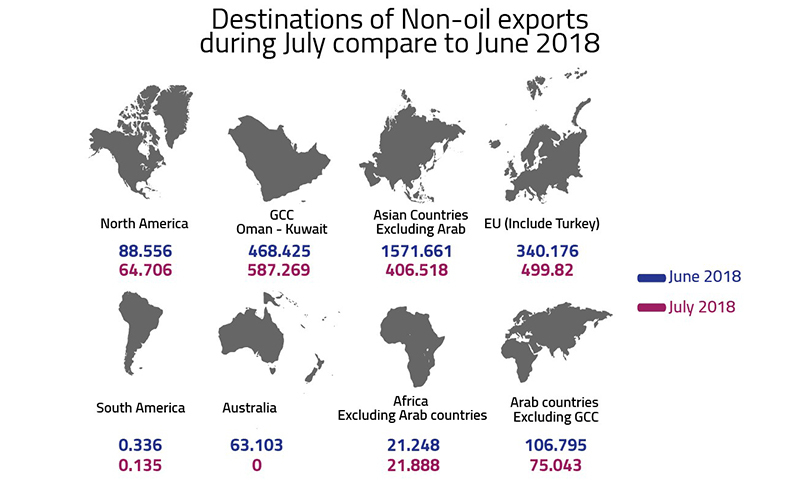 The report pointed to the trend of non-oil exports to 60 countries during July 2018 compared to (58) countries during June, with (13) Arab countries, including the Gulf Cooperation Council countries and (13) European countries including Turkey and ( 16) Asian countries except for the Arab countries and (13) African countries except for the Arab countries and two North American countries, as well as South America and Australia. In comparison with the previous month of June 2018, the number of countries that received non-oil exports in July increased by two countries. On the blocs grouping level, the number of Arab countries including the GCC countries, which received Qatari exports from 10 countries in June to reach 13 countries in July. African countries, excluding Arab countries, dropped from 18 in June to 13 in July, while the number of non-Arab Asian countries increased from 14 in June to 16 in July, and the number of European countries increased from 12 in June to 13 in July. The North American and South American groups increased from one country in each group last June to two in each group in July, in addition to Australia, during the past month. For the first time, Sri Lanka topped the list of non-oil exporting countries in July 2018 with a total exports of QR 771.1 million, representing 29% of the total value of non-oil exports during the month, followed by the Sultanate of Oman with total exports of QR 446.8 million (16.8 percent). In third place was Singapore with QR 296.7 million (11.2 percent) and Hong Kong QR 244.1 million (9.2 percent). Turkey ranked fifth with exports amounting to QR 112.3 million (4.2 percent) of the total value of non-oil exports in July 2018. The Netherlands, Germany, India, the United States and Australia came in different values and percentages respectively, where the first ten countries accounted for 86 percent of total non-oil exports in July 2018. 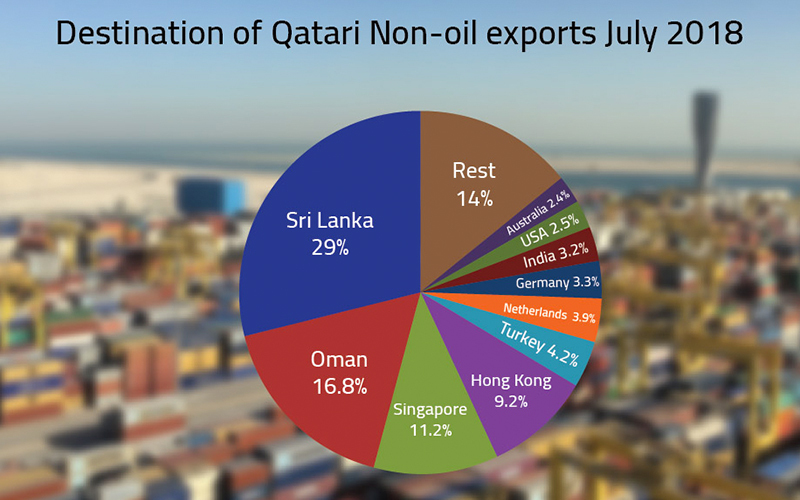 On the other hand, the Group of Asian countries excluding Arab countries topped the blocs and the economic groups receiving the Qatari non-oil exports during July 2018 with total exports amounting to about QR 1571.7 million followed by the GCC countries (Sultanate of Oman and Kuwait) amounting to QR 468.4 million , then the group of European countries including Turkey and exports worth about QR 340.2 million . The group of Arab countries, excluding the GCC countries, came in fourth place, with their markets absorbing about QR 106.8 million , followed by North America, Australia and the African countries except the Arab countries and the South American countries with varying values. When comparing the values of non-oil export trends by blocs and economic groups in July 2018 with their counterparts in June, there is an increase in the value of exports to each of the Asian countries except the Arab countries and the group of Arab countries except the GCC countries and the Group of American States North and South America and Australia, while the value of exports to the GCC countries (the Sultanate of Oman and Kuwait) and the group of European countries, including Turkey, as well as the group of African countries, excluding Arab countries declined. As for the types of the exports, iron topped the list in its various forms (grids, angles, iron bars and steel veins). 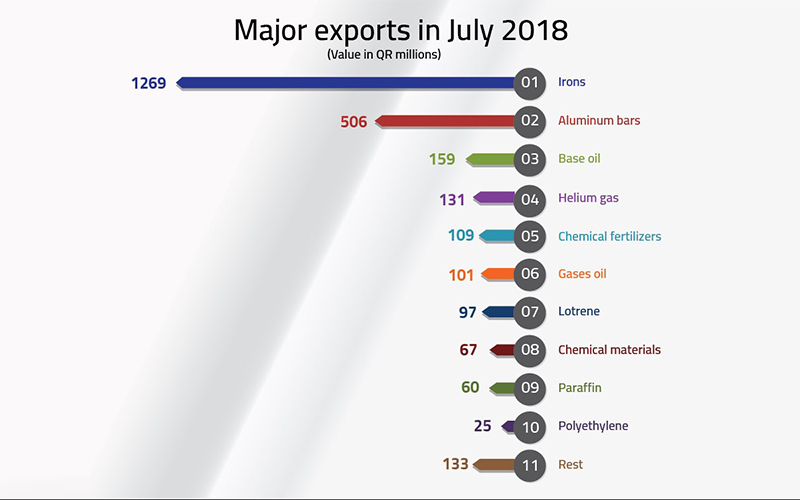 The value of exports amounted to QR 1269.1 million, representing 47.1 percent of the total value of non-oil exports during July 2018, and aluminum in its various forms (alloys, cutters, molds and slabs), where exports during the current month amounted to QR506.1 million, equivalent to 19% of the total value of exports.